Spotted a crow family when I went down to the Duwamish today. They were on Kellogg Island, which is the last holdout of the Duwamish’s natural channel. It was created by engineers who cut the waterway straight through a bend in the river, making an island that, at low tide, is surrounded on three sides by a brown mess of mud and a 30-foot-deep shipping channel on the fourth. 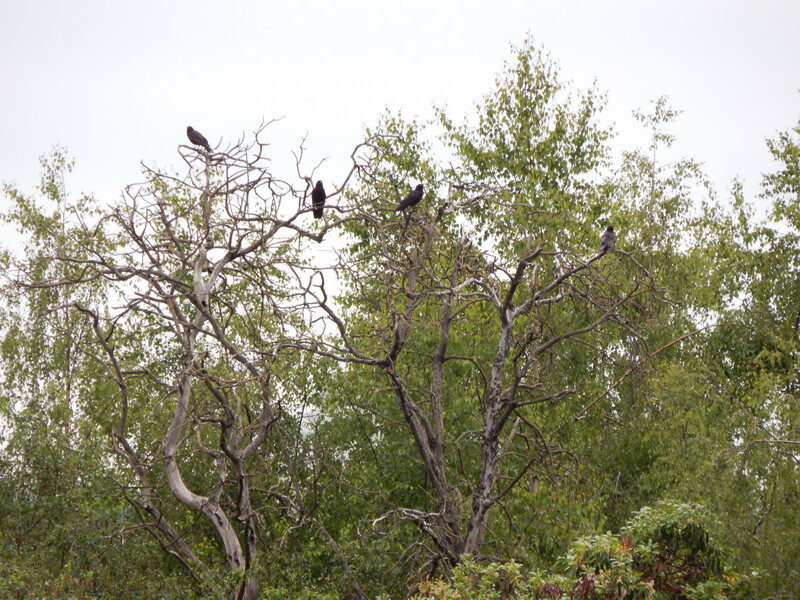 This murder of crows were hanging out in some containment booms that were washed up at low tide on the island. This is on the natural side of the island facing west. They were foraging for some good eats. Every few minutes they would fly up in a flock and then land back on the boom. Finally they landed with full stomachs in their family snag to watch the world go by. Just to the North of Kellogg Island is a reclaimed natural habitat that is surrounded by cranes and barges. As I was watching the wildlife there, a barge full of containers passed by headed south or up river. Here is a short video to show you how this is area is so taken over by man’s machines. At the end of the video you will see a mud flat. That is the north tip of the Crow Family’s island.